Who the frig is The Gritty Chimp? If Swim shows were qualifications 12 Oz Mouse would be a Ph.D. in Freakonomics. I have to confess, it was the show I never got into in the heady Bravo days. I think because of Bravo’s erratic scheduling I failed to notice there was any kind of continuity let alone any point to it and now I’m kicking myself for it! Matt Maiellaro should be a familiar name to any Swim aficionado having been one of the creative forces behind everyone’s favourite food based treat Aqua Teen, the parody of anime that is Perfect Hair Forever and the hick-tastic Squidbillies… Well ok, he was there for the birth of Squidbillies. That slack jawed, betentacled baby definitely belongs to Dave Willis now. I’ll get on to the squids some other time, this bit’s all about the mouse. With this project Maiellaro shifts focus squarely on character development rather than glitzy flash animation or gimmicks. With his other projects there was already something the audience could instantly hook into. For example Aqua teen sets our food based characters in a house with a neighbour and they’re…well, food! There’s no continuity allowing an infinite cavalcade of dadaist situations every week. Squidbillies, they’re squids and a little bit country. Perfect hair, the floppy fringed anime thing. With 12 Oz mouse there is no immediate sense of what’s actually going on. You’re presented with essentially animated scribblings. When Matt Maiellaro pitched this idea after the huge success of Aqua Teen and Space ghost it was on the premise that it would be ultra cheap to make and could be delivered quickly (in some cases very quickly with some shows airing unfinished). 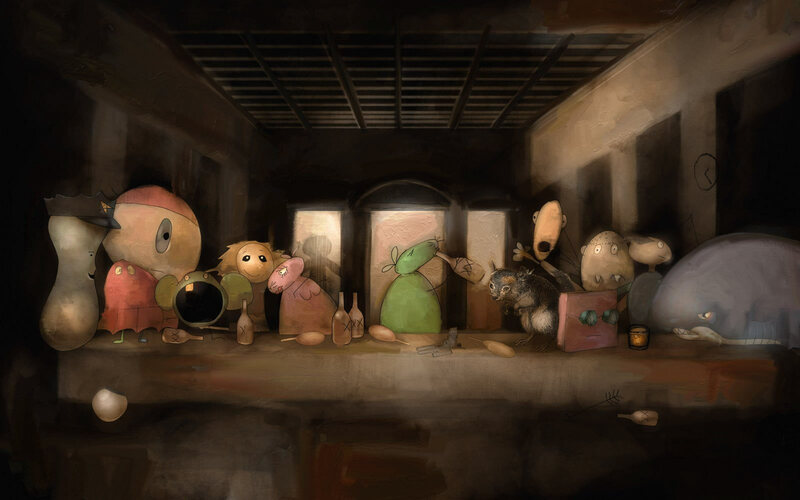 He drew the characters himself to the best of his ability, which is not very much at all, and decided that the world they lived in was made of cardboard. Should he have explained this to the audience? No need and that’s the essence of 12 Oz Mouse. The lack of anything to instantly grab you means if you want to get into 12 Oz Mouse you have stop looking at the ‘why?’ and just see what happens. There’s a mouse called Fitz, everyone around him isn’t a mouse. The world is very basic but nobody cares. So what does the mouse do? He drinks beer occasionally (his favourite drink is 12 beers) but that’s not a big part of it but it is a part of it. He has a pal named Skillet who is a squirrel/ Chinchilla and an excellent drummer, he doesn’t speak he just squeals loudly. 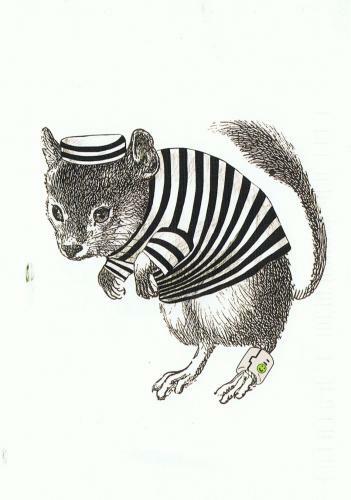 Oh and Skillet isn’t drawn, he was nicked from some old clip art book. He looks all the better when wielding a deadly arsenal in one of the show’s many action scenes or when gagged with a gimp ball whilst the hula hooping ‘New guy’ tortures him with mesmerising music. Then there’s a shark voiced by the talented Adam Reed of 70/30 fame. He’s sort of the boss. The shark as you can imagine doesn’t move so well out of water although he’s able to breath, drive a car.. oh and he’s bullet proof. 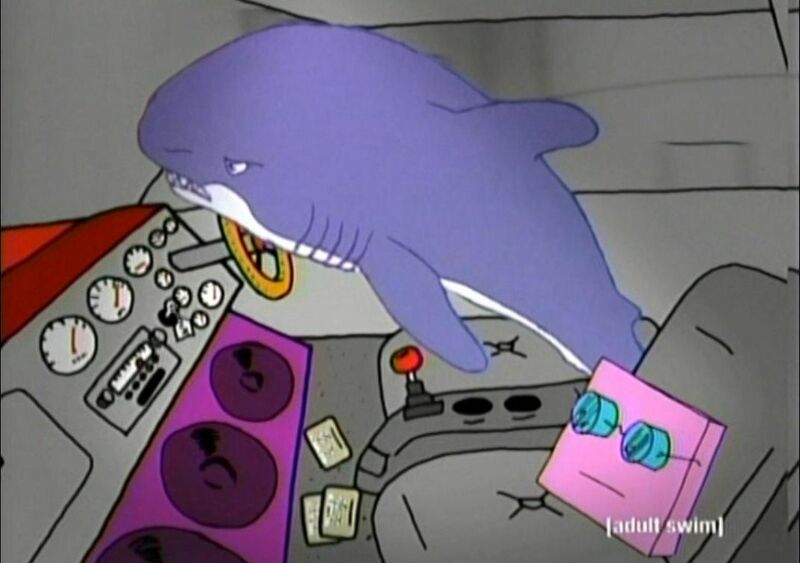 The image of the shark is the other character not actually drawn by Maiellaro and is stolen from an old episode of Sealab and was used numerous times by different shows, most famously appearing in Space Ghost. The shark’s closest associate is a pink square with glasses but no eyes. That doesn’t stop him from seeing though. He’s also very rich and very arrogant. Have I lost you yet? You see if you happen to catch an episode you can look at it two ways. Firstly you could see it as an absurdist, one off cartoon with badly drawn yet excellently scripted characters. It may just turn you off or you could spend 11 minutes mesmerised by the pretty shapes and perfectly executed use of the pregnant pause. On its own an episode makes very little sense. Your other choice is that you could become a mouse devotee and follow it from start to finish. Things happen, characters appear and disappear, there’s the occasional musical number, in fact one episode is just raw footage from the title scenes with Matt Maiellaro’s music on top of it spliced with bits from the show. It all seems very weird for the sake of being weird but this isn’t the case. If you are familiar with the Black Lodge or the Log Lady scenes from David Lynch’s Twin Peaks you’ll get a sense of what he’s trying to do here in terms of story telling, albeit in a much more comical way. The truth about 12 Oz Mouse is that there’s a gloriously constructed conspiracy story underneath all the weird but the two aren’t mutually exclusive. Some episodes go nowhere just when you think you’re getting your head round it. For instance, it took me two seasons to figure out the wall clock was a character let alone the boss! The story is brought together through the superbly written dialogue between characters, professionally done by Maiellaro himself and the co-workers he thought would best suit the role. Take the stoner peanut cop for instance. This is voiced by Nick Weidenfeld, the executive producer who green lit the project. It’s testament to the way things work over at Williams Street that everyone scrubs up and gets behind projects that excite them and it’s the only reason anything like this could ever air. It was animated, usually at very short notice by the folks at Radical Axis, masters of flash animation who go far beyond the usual stuff you get on the web. 12 Oz Mouse will tickle the most gooey parts of your brain if you let it. Don’t be a chump like I was and dismiss it as nonsense, let Fitz into your life and surf the weird for a while.